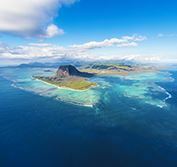 Combine South Africa & Mauritius on one of our thrilling wheelchair accessible safari holidays & vacations. See the Big 5 at Hluhluwe Game Reserve in Zululand, which saved the rhino from extinction & is malaria free. Visit an Elephant & Wild Cat sanctuary, Lake St Lucia & Cape Vidal thne fly to the tropical island of Mauritius, with its clear turquoise waters. All game drives, park fees, accessible hotels & transfers included. You will be met at Durban Airport and transferred to the warm North Coast, renowned for its wonderful beaches and excellent holiday weather. Check into your hotel and relax on the shores of the Indian Ocean. Today enjoy a full day sightseeing tour of the highlights of Durban. We start with a drive along the Golden Mile, the beachfront promenade with its colourful street markets, and through the Point Waterfront. We continue past the beautiful old City Hall to the small craft harbour at Wilson's Wharf and drive past huge sugar terminals and busy harbour warehouses to the University of Natal campus, which has lovely views over the harbour. Then we visit the bustling African/Indian Markets at Warwick Triangle – home to 9 different markets developed around Durban’s largest public transport interchange, where over 6,000 street vendors ply their trade – an authentic cultural experience. Afterwards we visit the peaceful Durban Botanic Gardens, founded in 1849 and home to a magnificent orchid house and many massive trees from Asia, Africa and America. Our tour ends with a visit to the iconic Moses Mabhida Stadium that was built for the 2010 World Cup. Here there is the option of taking a cable car ride to the top of the stadium for a phenomenal view over Durban and its coastline (pay locally). Note: Moses Mabhida Stadium is closed on Saturdays and any other match day. This morning your guide will introduce you to the beauty of rural KwaZulu Natal as we travel 3.5-hours to Hluhluwe in Zululand. Along the way we stop at an authentically reconstructed Zulu Village to learn more about Zulu life and culture, including their amazing beadwork. We also meet a sangoma ("witchdoctor"). Check into your safari lodge situated near the gate into the famous Hluhluwe Game Reserve that is renowned for its outstanding game viewing. Here you will have the opportunity to enjoy a thrilling game drive with your guide. Today is devoted to game viewing in Hluhluwe National Park, travelling with your guide in his air-conditioned vehicle. As you will have the services of a private driver/guide throughout your safari, you will have the flexibility of discussing preferred routings and travelling times with him each day. However we recommend setting off early each morning as the camp gates open (05.30 to 06.00 depending on the season), to take advantage of the best game viewing conditions of the day. One of South Africa’s most beautiful game parks, Hluhluwe is home to all the Big 5 - lion, elephant, buffalo, leopard and rhino - as well as the subcontinent’s largest population of endangered rhino, which this park saved from extinction. Game viewing opportunities should present themselves almost immediately and hope to see many other interesting species too - including giraffe, zebra, wildebeest, hippo, kudu, crocodile, waterbuck, warthog and baboon. With over 300 different bird species, outstanding bird watching is also guaranteed. After a beautiful African sunset, enjoy the balmy evening and pristine stars of the southern hemisphere. Note: Vehicles are not allowed to drive off-road in any national park in South Africa. If you are tall and remain in your chair for your game drives, please be aware there will be some restrictions on your viewing due to the height of the windows in the accessible vehicle. There are no restrictions if you transfer into one of the regular seats. This morning you will have the unique opportunity to interact with two mature orphaned African Elephants. These powerful yet gentle creatures have been hand reared, but now roam free in a large private game reserve. Each morning they visit the viewing area for a snack of game pellets, where you can get up close to them and learn more about these gentle giants. We stop for lunch (own account) at Ilala Weavers, where you can see traditional Zulu basket weaving and beading. In the afternoon we visit a Wild Cat and Cheetah Rehabilitation Centre which cares for animals that have been orphaned or injured in the wild. Here you will see and learn more about some of South Africa's endangered wild cats - including the caracal (lynx), serval and magnificent cheetah. This morning we travel 30-minutes to the small town of St Lucia on the KwaZulu Natal northern coast. Situated inside the Isimangaliso Wetlands, this whole area has been declared a RAMSAR Wetland of international significance because of its great biodiversity and importance as a breeding site for waterbirds. Over 520 different species have been recorded in this vast wetland that is surrounded by mangrove swamps and dense reed beds, with birds ranging from permanent residents to tropical and altitudinal migrants, regional nomads and long-distance migrants. These include a variety of storks, pelicans, flamingos, kingfishers, spoonbills, fish eagles, gulls, herons, terns, ducks and geese. On arrival enjoy a boat ride on the Lake St Lucia estuary, where you may see hippo, buffalo and crocodiles as well as abundant bird life. Note: The St Lucia boat has access ramps, but there is no accessible toilet. If you use a power chair, the boat ride needs to be booked when the tide is up. Today we venture further into the Isimangaliso Wetlands and travel to the remote beaches of Cape Vidal Nature Reserve, where you will see thousands of ghost crabs scurrying around for food. With over a hundred miles of pristine coastline and the tallest forested dunes in Africa, these titanium-rich beaches are an important breeding ground for giant loggerhead and leatherback turtles, who nest and lay their eggs under cover of darkness from November to January, with the hatchlings emerging and running the gauntlet of ghost crabs from February to March. Pods of dolphins are often seen in these waters and from June to November, you may be fortunate enough to see humpback whales, who migrate from Antarctica to mate and calve in these warm waters. In Cape Vidal Nature Reserve you can also hope to see rhino, waterbuck, kudu, zebra, reedbuck, porcupine and many other smaller animals. Birdlife too is prolific with habitats ranging from grassland to swamp, sand and coastal lowland forest. There are also a variety of aquatic habitats including rivers, marshes, lagoons, estuaries and the beach. Here you can hope to see Great white pelicans, Marabou storks, Yellow-billed storks, African spoonbills and African fish eagles, whose calls can be heard along the shoreline. Sometimes after a storm, seabirds such as the Yellow-nosed albatross, Giant petrel, Tropicbird, Frigatebird, Sooty tern and Noddy tern are blown closer to shore, allowing for some wonderful close-up sightings. Transfer 3-hours to Durban Airport for your onward flight. Enjoy lazy days relaxing in beautiful Mauritius in sparkling turquoise Indian Ocean and savour the fine Creole cuisine - especially the superb seafood. Dolphin-watching catamaran cruises are also very popular, as well as glass-bottomed boat rides to view the surrounding coral reefs swarming with tropical fish.